In this post, we start with an overview of "Pattern Matrices" question types, including what skills they measure and how many are on the OLSAT test. We also provide a sample question, accompanied by tips and strategies to help your student perform successfully on "Pattern Matrices" questions during the official OLSAT® exam. Pattern Matrices: What To Expect? 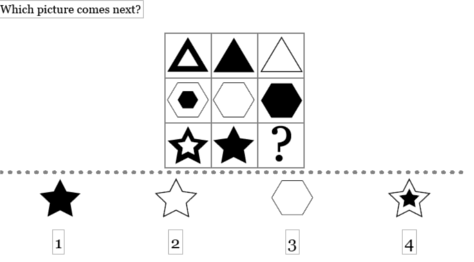 “Pattern Matrices” questions, like series questions, assess a student’s ability to predict, according to a rule, a missing element in a series of pictures or figures. With this question type, a student is shown a series of figural shapes that change across the rows and columns throughout the design. These questions require the child to understand how the objects in rows and columns relate to each other. The student must isolate and apply the rule/s in order to identify which object from the answer choices fits the empty box in the bottom right-hand corner of the matrix. Pre-K students taking the OLSAT® (for admission into Kindergarten) are asked approximately one of these types of questions. Kindergarten students taking the OLSAT® (for admission into 1st Grade) are asked approximately two of these types of questions. Encourage your student to carefully consider all the answer options before selecting one. Ask her to eliminate obviously wrong answers to narrow down the answer choices. Ask your child to explain what is happening in the matrix, and why he or she chose a specific answer. This will help you understand where your student needs support in understanding the pattern. Encourage your student to visualize -- observe, imagine and keep track of -- the changes in the geometric shapes as they move and then draw what she predicts she might see in the empty box. If your student is challenged with a pattern matrix question and finds it hard to detect the rule/s, take a step by step approach. Learn more about the different question types on the OLSAT, including Following Directions, Aural Reasoning, Arithmetic Reasoning, Analogies, Classifications, and Series. Also, learn everything you need to know about other tests that measure a child’s potential to learn in school, like the NNAT2.